The Martha Stewart Living Modern 3 in. 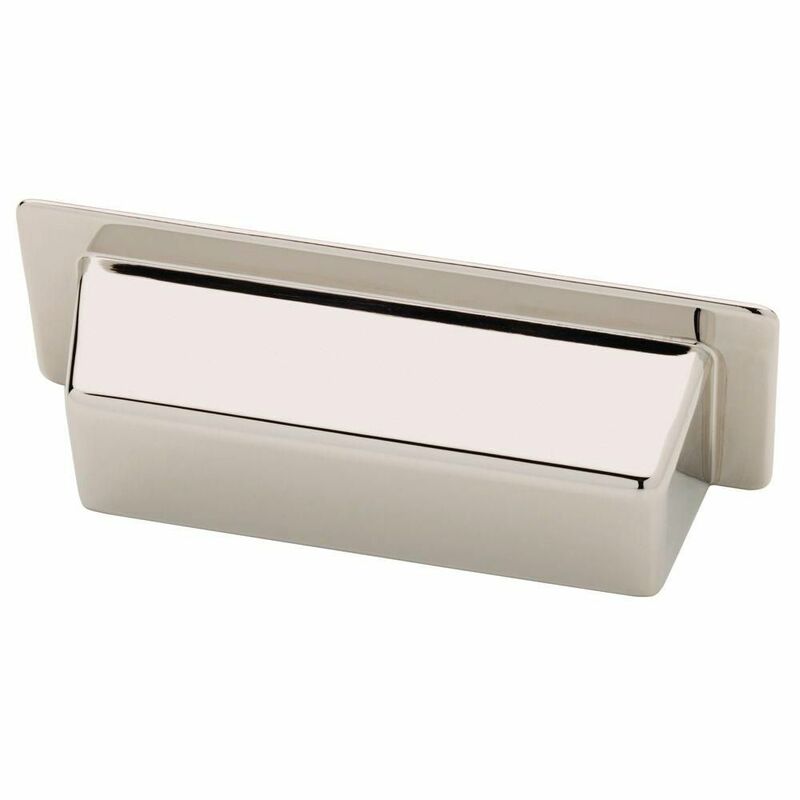 Polished Nickel Alcove Bin Pull features a contemporary look with geometric lines and a bright polished nickel finish. Complement your style with this bin pull. This pull is easy to install with the included fasteners. Amerock Esquire 3-inch and 3-3/4-inch (76 mm and 96 mm) CTC Pull is finished in Polished Nickel/Gunmetal. Innovative, ground-breaking ideas are the inspiration that drives Esquire. This striking mixed media collection pairs upscale finishes with textured accents that puts any room on the cutting edge of design. Elegant and eye-catching, Gunmetal is the perfect alternative for those who love metallic, but prefer a hint of subtlety. Use this finish to enhance the modern ambience of stainless steel and Black appliances without overwhelming their natural gravity, while Polished Nickel offers the beauty and luster of sterling silver without the cost or care it takes to maintain. Amerock markets decorative hardware solutions that inspire, coordinate and help express personal style. For the kitchen, bathroom and the rest of the home, with a variety of finishes and designs for all decorating tastes, Amerock is the ultimate, time-tested source for hardware needs. Amerock markets products in four categories: decorative hardware, decorative hooks, bath accessories and functional hardware. 3 in. Alcove Bin Pull The Martha Stewart Living Modern 3 in. Polished Nickel Alcove Bin Pull features a contemporary look with geometric lines and a bright polished nickel finish. Complement your style with this bin pull. This pull is easy to install with the included fasteners. 3 in. Alcove Bin Pull is rated 4.5 out of 5 by 14. Rated 5 out of 5 by Lolo from Used on Asian dresser drawers. They are stunning and affordable. Used on Asian dresser drawers. They are stunning and affordable. Rated 2 out of 5 by Camille from We had this less than a week and before we... We had this less than a week and before we even installed it, a portion of the silver paint had already chipped off. It was literally just sitting in the bag and while getting taken out of the bag to figure out the holes, it chipped. Rated 5 out of 5 by mari from they are beautiful and were exactly what I was looking for. they are beautiful and were exactly what I was looking for. Rated 5 out of 5 by JC from Beautiful!... Beautiful! Rated 5 out of 5 by Christine from Very nice quality product. They feel solid and Look great!... Very nice quality product. They feel solid and Look great! They are 3 inches between screw holes but a total of 4 inches actual width. Rated 4 out of 5 by JJinMI from Very nice looking pulls They are very attractive. They worked nicely for the antique dresser I installed them on, because they cover up an extra hole that was drilled at some point in between the two holes that they fit into. Kind of pricey, I think.